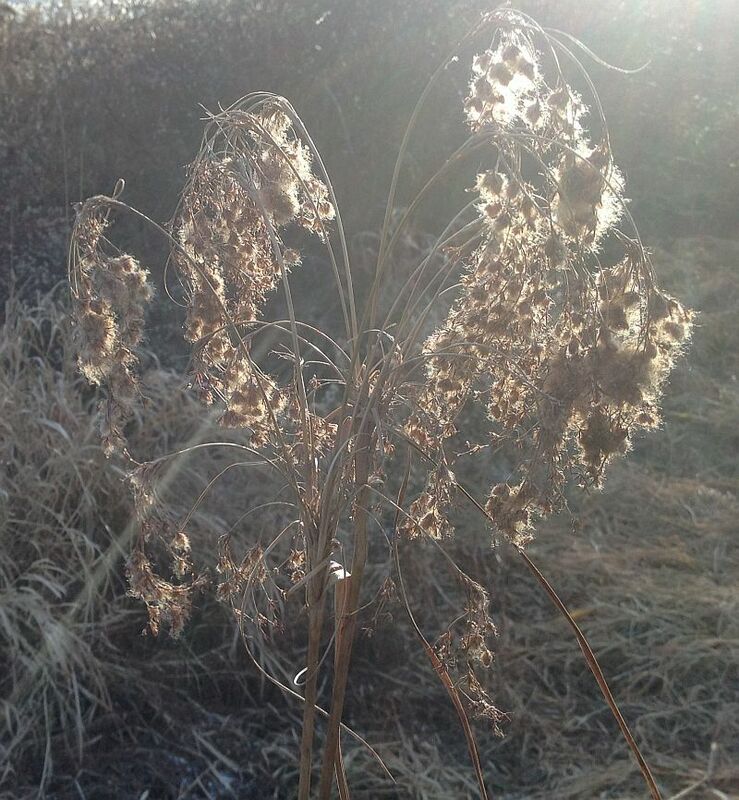 Before the snow covers the ground and changes the landscape to true winter, covering up many of the remains of our wildflowers, we would like to highlight the amazing beauty found in winter “flowers”. Although one can still find an occasional intrepid flower head of Dandelion, Aster, or Goldenrod full of colorful blossoms, most actual flowers have long wilted by Thanksgiving. However, many of the fruits and seeds that now take the place of the flowers have a pleasing symmetry in shape and a flower-like quality, even if their color palette is limited to mostly white, silver, tan, and many shades of brown. Here are some examples we found around Hawthorne Valley over the last few days. This graceful structure stranded on the ice of the farm creek is the fruit of one of the many wind-dispersed species in the aster family. 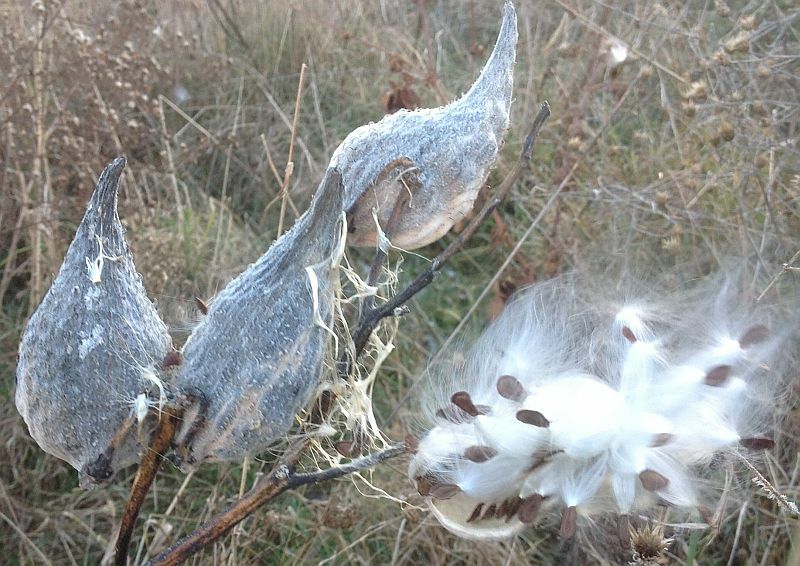 It is composed of a 1-seeded “achene” which carries an umbrella or “pappus” to help the seed fly through the air. 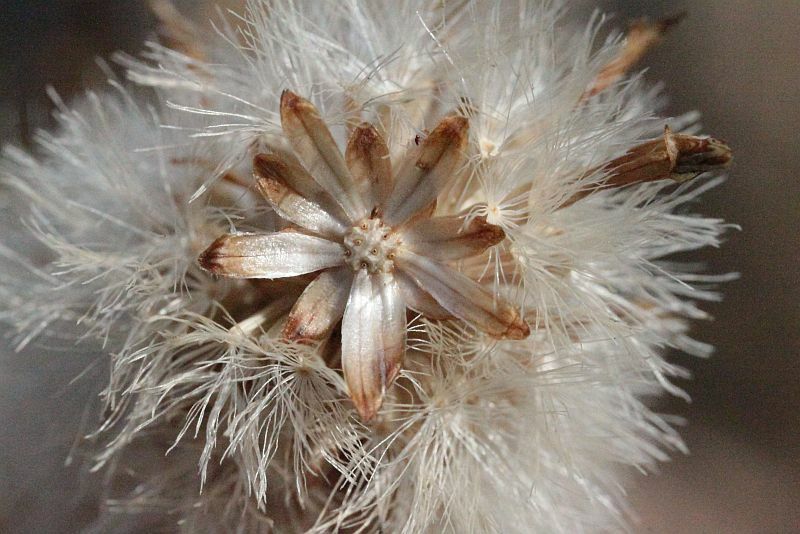 The wind-dispersed seeds of asters, goldenrods, Joe-Pye-Weed, and Boneset develop in flower heads, surrounded by a set of specialized leaves, the “bracts”, which often remain on the plant long after all the seeds have flown away and form a shape that looks like a silvery flower, itself. 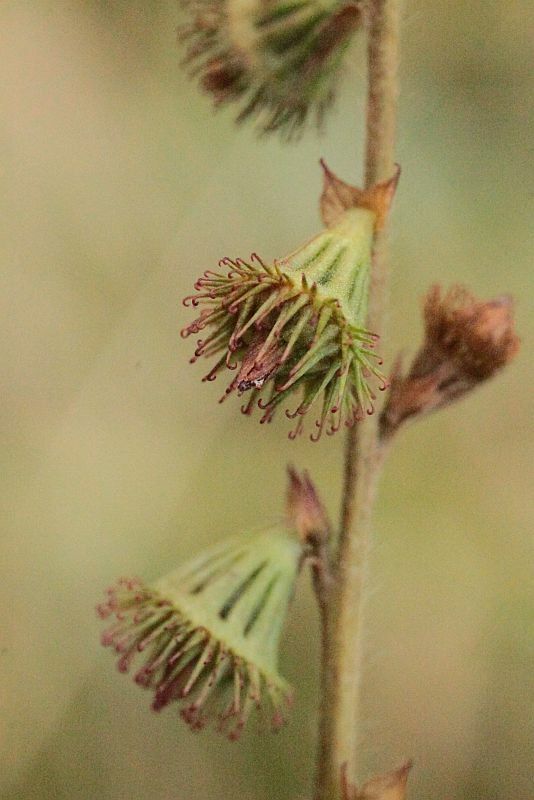 This picture shows a dense cluster of several flower heads, the center one having dropped all its seeds and displaying the flower-like structure composed of bracts. It is surrounded by the white umbrellas of seeds still attached to other flower heads. 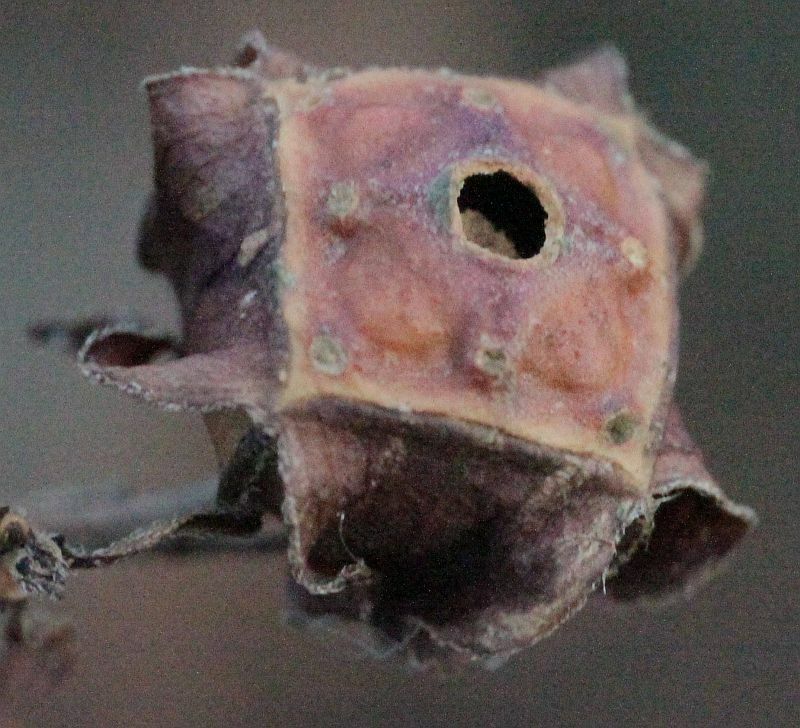 The brown structure on the right is a single withered, narrowly bell-shaped flower, still attached to the seed growing underneath it and surrounded by the seed’s “pappus”. The one-seeded fruits of Virgin’s Bower have feathery appendices that help them get carried away by the wind. They are arranged in clusters, each of which developed from a single white flower. Virgin’s Bower is a vine, whose fluffy fruit clusters can currently be seen draping over shrubs and tree branches in hedgerows and riparian areas. 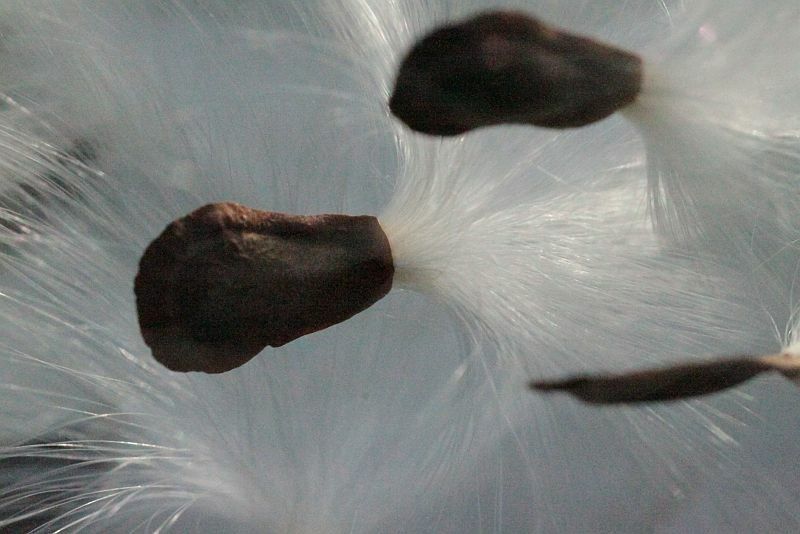 Milkweed seeds are another well-known example of wind dispersal. 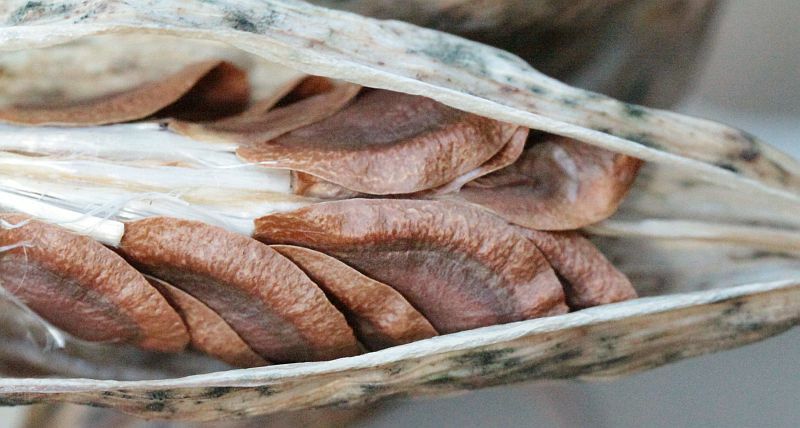 They grow tightly packed inside pods. 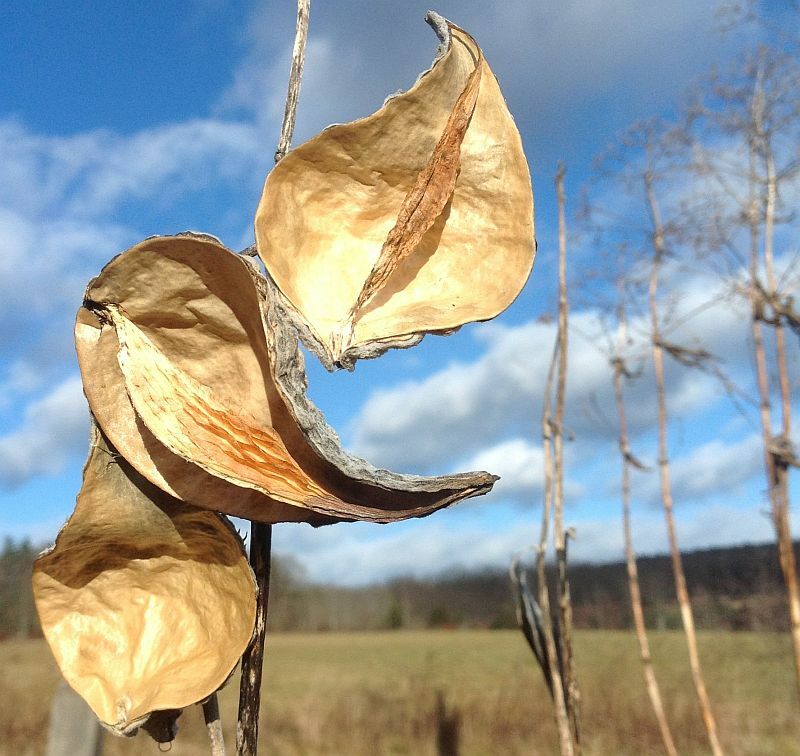 … until nothing else but the empty pod remains on the stalk. Woolgrass is only remotely related to true grasses. 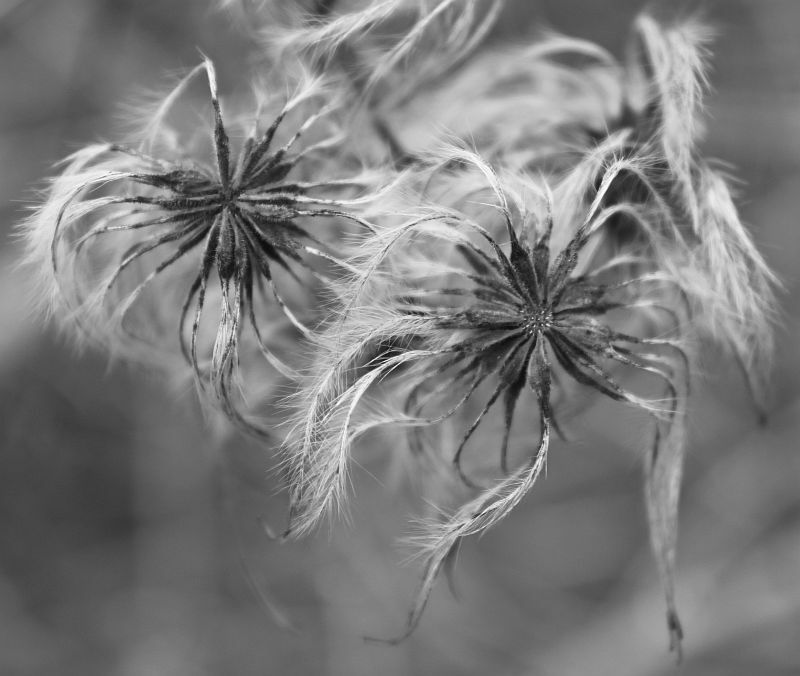 Its seeds are also wind-dispersed by means of “woolly” hairs. 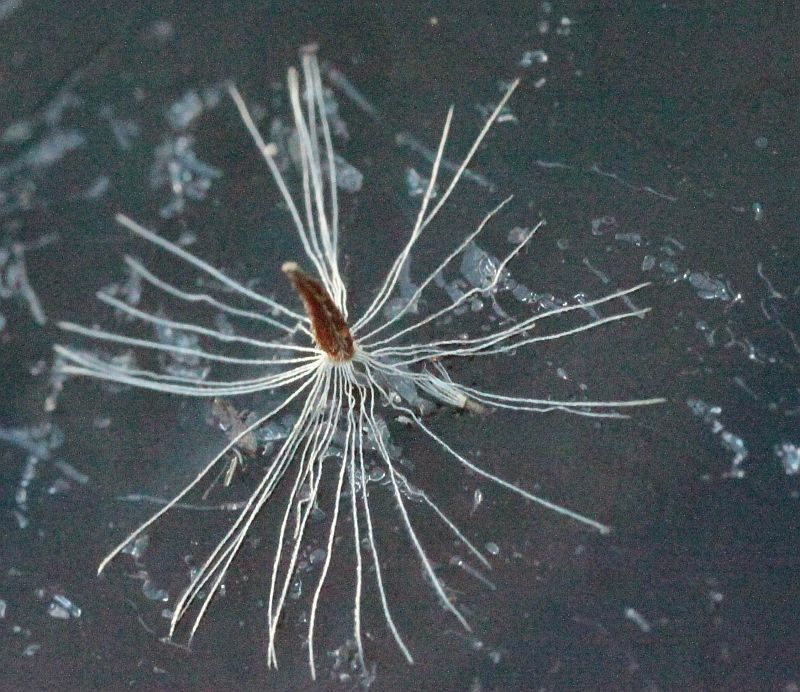 The fruits of Seedbox resemble little salt shakers who release their tiny seeds through a hole in the center, as the dried plant gets moved about in the wind or by passing creatures. Each fruit is less than 1/4 inch across. Note the flower-like pattern surrounding the central hole. The flowers of Wild Bergamot grow in dense flower heads. The tightly packed calyxes persist far into the winter. 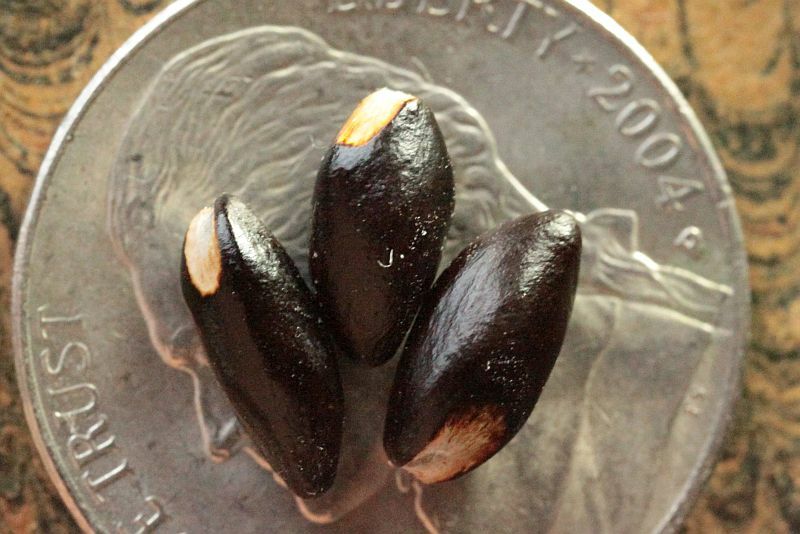 Several little seeds have long since been released from the depth of each calyx cup. Brown-eyed Susan is a member of the aster family whose one-seeded fruits bear no umbrella. 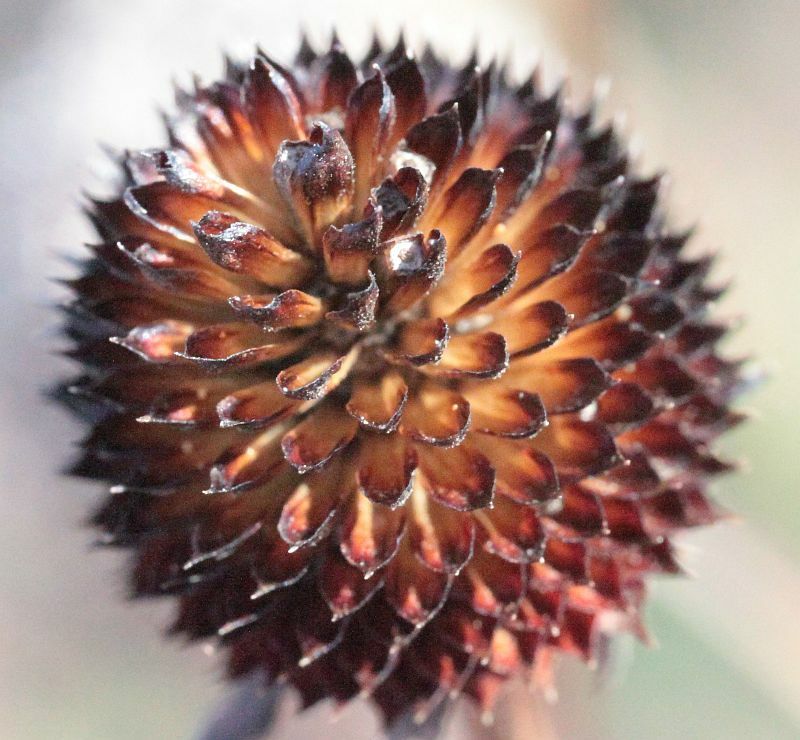 In this picture, a few fruits, held by their protective bracts, can still be seen at the center of the flower head. 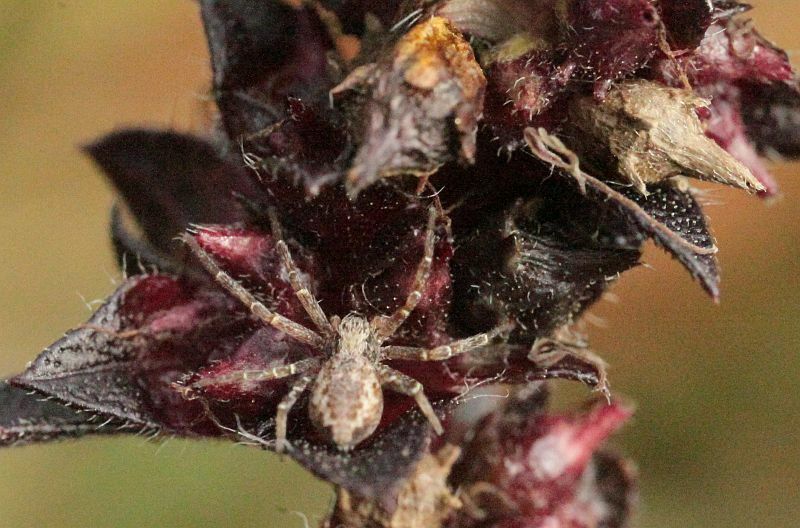 This little spider sits on a fruit of Common Ragweed. Note how the color of the spider makes it blend in perfectly against the fall coloration of the plant. Below are the remains of male flowers of the same plant, which in late summer released innumerable tiny pollen grains that are one of the main causes of seasonal allergies. 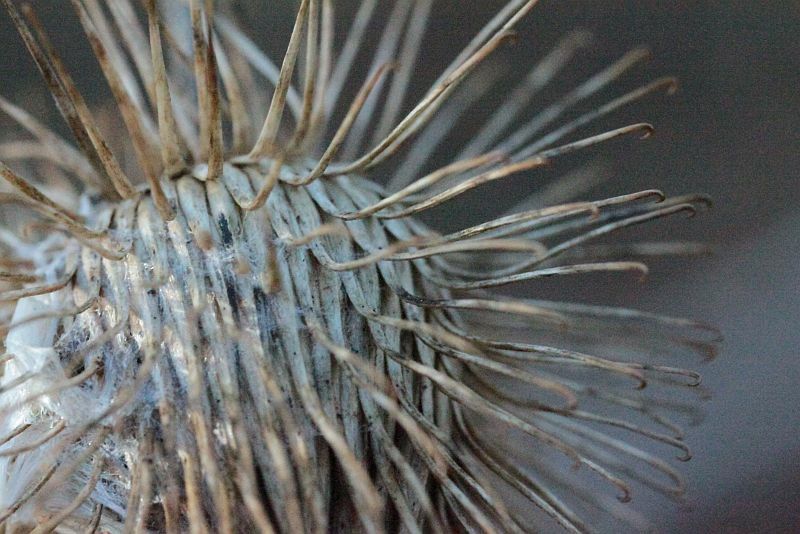 The seed heads of Common Burdock are the natural “velcro”. They are designed to get stuck in animal fur and to disperse as hitch-hikers. Have you ever got one of these stuck in your hair? No fun! 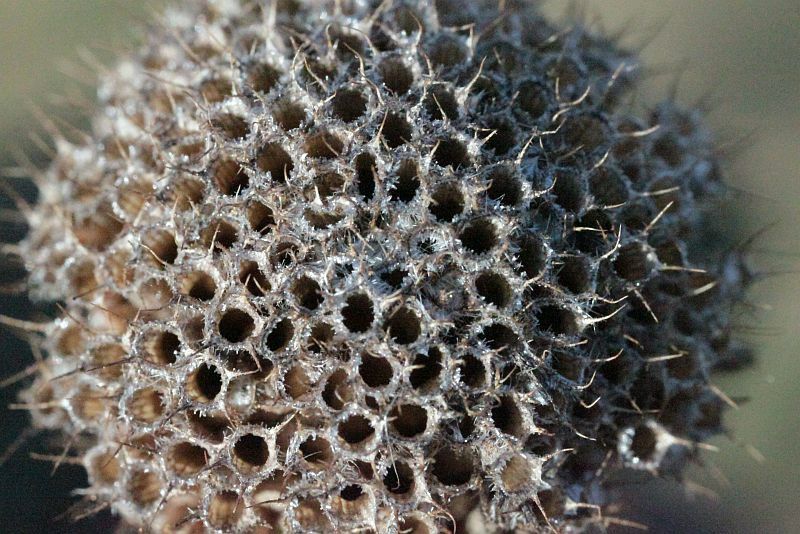 But looked at closely, the burs (which are really the remnants of flower heads, with the mature seeds still hiding inside) have a certain visual esthetic about them. 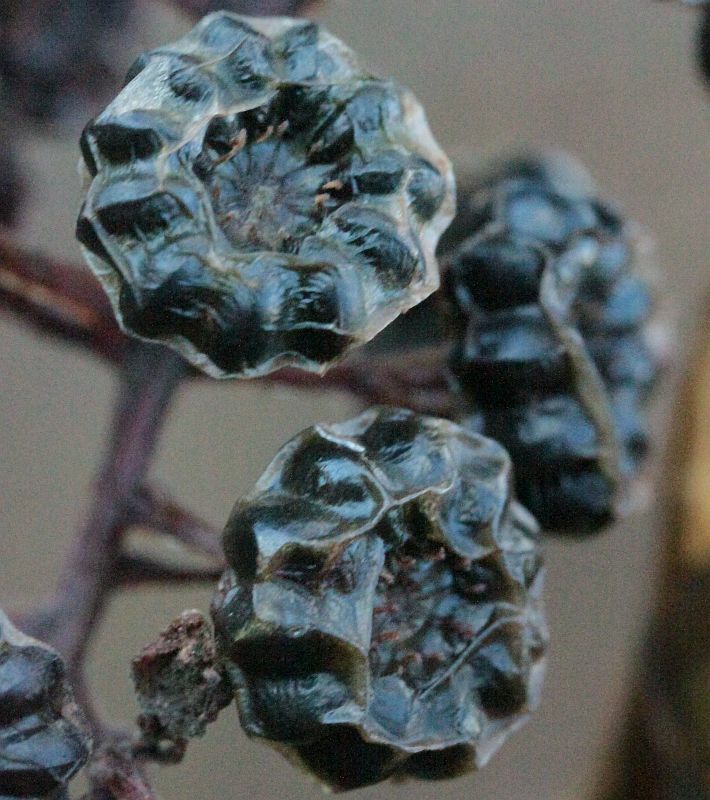 The plump and juicy deep purple fruits of American Pokeweed are getting dry, revealing the incredibly regular circular arrangement of seeds underneath the now transparent skin. Many parts of this plant, including the seeds, are poisonous to people! Finally, here is a true late flower. 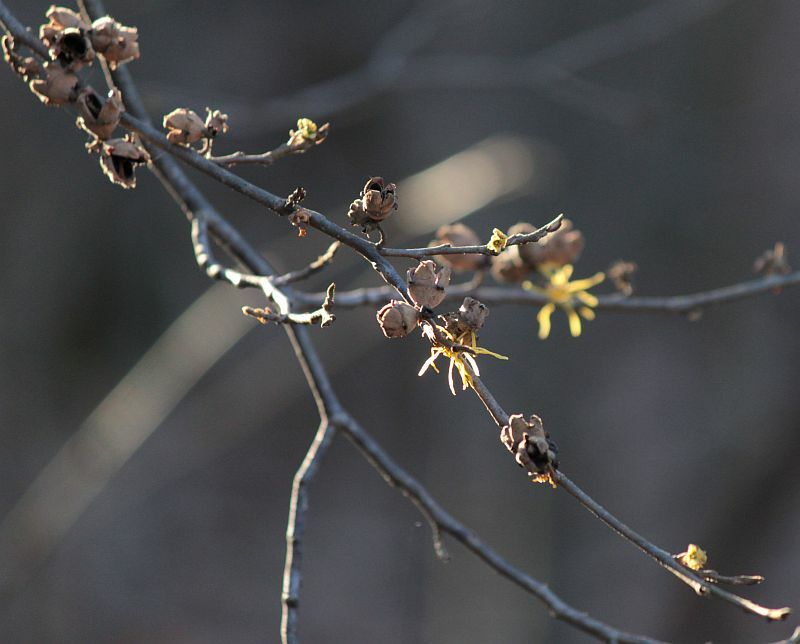 It belongs to Witchhazel, a woody plant of the forest understory. Its delicate yellow flowers appear in October, just as the leaves turn yellow, and can often be seen alive and well into the winter. 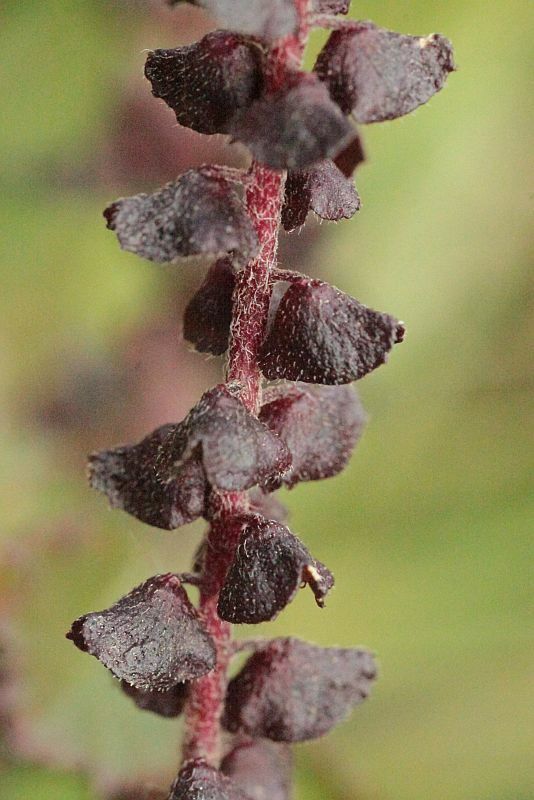 Below the flower are two open seed capsules which have ejected their seeds. An entire Witchhazel branch with mixed this year’s flowers and fruits that have developed from the flowers that bloomed last fall. Try bringing home a few closed seed capsules and let them dry on the mantelpiece. 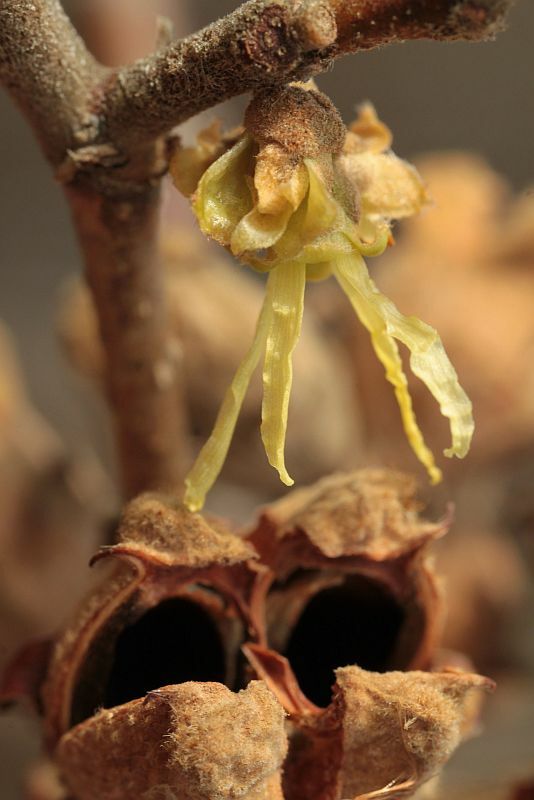 As the capsules dry, they begin to open and shoot the seeds across the room. Alternatively, put them in a tin can and enjoy the “ping-ping-ping” as the seeds get released with great force. A Trio of (Somewhat) Obscure 19th Century Naturalists from the Region: Relevant Bygones. Clockwise from the top. 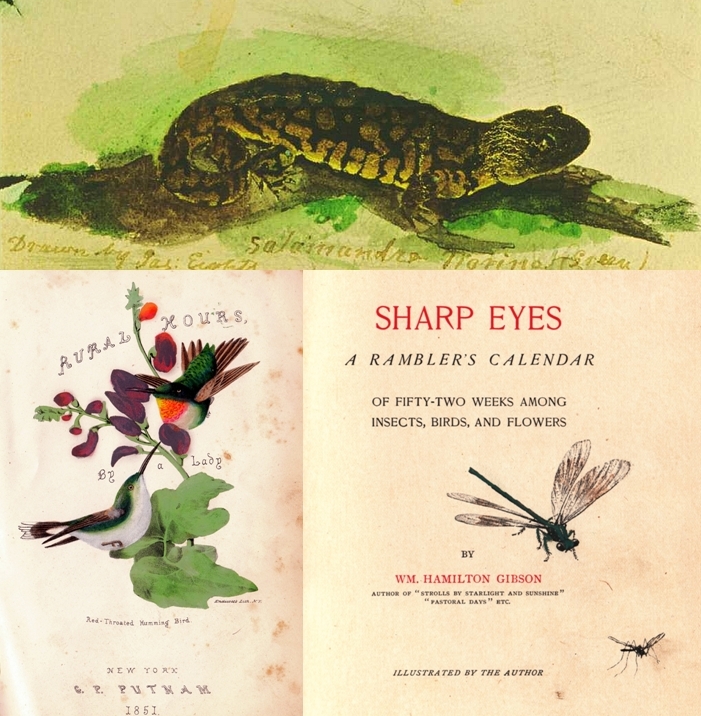 A Tiger Salamander sketched by James Eights (from McKinley’s book on Eights); the title page of William Hamilton Gibson’s Sharp Eyes, and the title page from the illustrated edition of Susan Fenimore Cooper’s Rural Hours. Reading the words of past naturalists who wrote about familiar landscapes can seem nostalgic, however, such reading can also reveal immediate relevance for at least two reasons: first, each naturalist is a new set of eyes on the World, perhaps recounting new observations that one has never noticed oneself; second, these writers are describing past incarnations of one’s own landscape, thereby revealing changes that might otherwise go unmarked and hinting at potentials that may still exist. This blog posting serves to introduce a trio of somewhat forgotten naturalists from “the area”: James Eights of the Capital District, Susan Fenimore Cooper of Cooperstown, and William Hamilton Gibson of Litchfield County, CT, and Brooklyn, NY. These three (together with some possible ‘special guests’) will be the basis of many of our upcoming Facebook posts. Each of these people published nature journals of a sort, and we will use many of our posts to recap some of their sightings and compare them to what we see around us today. A portrait, apparently by scientist and colleague Ebenezer Emmons, showing Eights around 1840 at about 40 years of age. Source: New York State Museum. Our first naturalist is James Eights, probably born in Pennsylvania around 1798, his family soon moved to the Albany area. His father was a well-respected medical doctor, and while his schooling is unknown, when he appears in the historical record, he is already pursuing naturalist ways. For most of the rest of his life, he seems to orbit around the Capital District, occasionally heading to the South Seas (he apparently visited Patagonia a year or so before Darwin and a coast of Antarctica is named after him), Central America and other regions, but, sooner or later, returning to his old haunts. Eights seems to have supported himself (barely) as a scientist and draughtsman, but he held few steady jobs and, one almost feels, roamed the periphery of the day’s scientific hotspots, brushing elbows with better known scientists of his day, such as Amos Eaton and Ebenezer Emmons, but never settling into their sometimes tumultuous circles. His bibliography is a string of generally short articles on varied themes published more often than not in popular rather than strictly scientific journals. One installment of his “Scraps from a Naturalist’s Note Book” as it appeared in the fireside section of the Country Gentleman during 1853 (left). 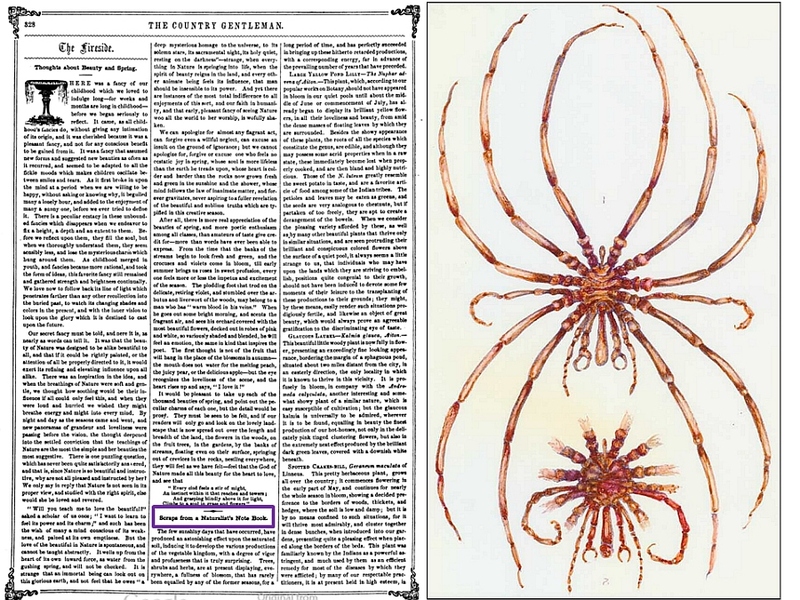 His collection and description of a 10-legged Sea Spider, Declopoda (right; in his own illustration), from the South Seas was responsible for his 20th century, posthumous rediscovery. Eights qualifies for our group because of three sets of articles he published at various points in his life, each of them describing aspects of the natural history which he saw around him. The first series was his “Naturalist’s Every Day Book”, published in the Albany-based Zodiac, chronicling the seasonal events of May through Sept 1835. Some 18 years later, in 1853, he published 24 installments of his “Scraps from a Naturalist’s Note Book” in the Country Gentleman, a weekly agricultural magazine printed in Rochester but widely circulated. Finally, 1864 he published a collection of 8 articles entitled “Our Songsters of Summer” in the same journal. For the most part, these are short accounts mixing descriptions of plants, insects and other animals together with brief asides on the feelings they provoked. They tend to be a potpourri, mixing intriguing descriptions of local flora and fauna with more exotic or generalized accounts. The only image of Susan Fenimore Cooper which I have been able to find. It was probably taken around 1850 when she published Rural Hours.at the age of 37. 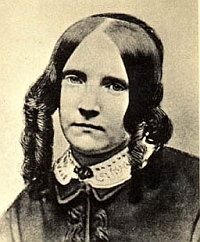 Our second regional naturalist is Susan Fenimore Cooper (1813-1894), daughter and secretary of novelist James Fenimore Cooper. Cooper was a philanthropist, editor and writer, but her inclusion here is due to her best known work, Rural Hours, a year-long series of natural and cultural observations from near her Cooperstown home (although presented as a single year’s journal, it is actually a compilation of two years’ observations). First published in 1850, Rural Hours mixes astute observations of surrounding people, plants and wild creatures with religious and philosophical ruminations. Her descriptions are detailed and ring true, reflecting not only her surroundings but also the ‘state of mind’ of people like herself living in what had recently been the frontier of colonial settlement. Cooper’s work has been compared to Thoreau’s Walden (1854), and, apparently, had some influence on that piece. Unlike Eights’ disconnected snippets, Rural Hours is a single, coherent work, containing both more ecological detail and reflection on nature’s significance. Rural Hours achieved quick acclaim and went through numerous 19th century editions, although it fell from favor during most of the 20th century. More recently, it has seen something of a resurrection, with a 1998 edition and a wave of new critical consideration. Susan Fenimore Cooper lived into her 80s, but focused much of her later energy on stewarding her father’s literary estate and on philanthropic work. 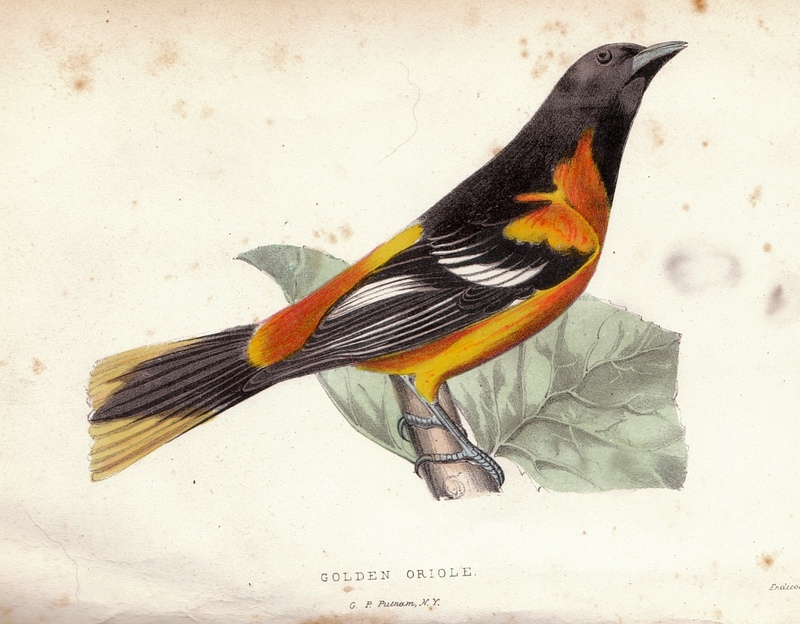 The illustration of the Baltimore Oriole from Rural Hours; the bird images were apparently reprinted from DeKay’s 1844 bird volume in the state-published Natural History of New York series. The last of our trio is William Hamilton Gibson (1850-1896), a CT and NYC based naturalist writer and artist. His biographer declared him to be, together with Thoreau and Burroughs, one of the great naturalists of 19th century America, and yet today he is certainly the least known of that triumvirate. Beginning as an illustrator, Gibson achieved substantial recognition during his own lifetime, largely for the illustrated articles he contributed to various magazines of his day and for the books and compilations he published. 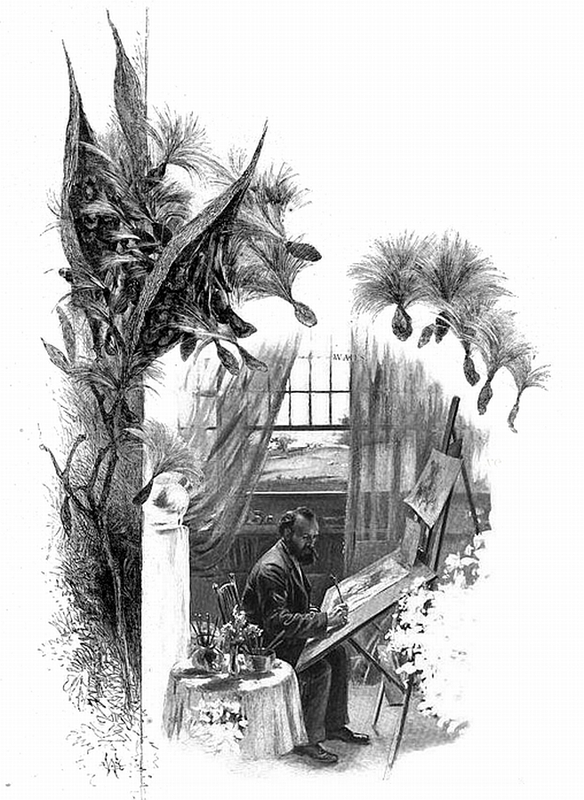 Although some of his writing may seem flowery, he was obviously a skilled artist and, like the preceding pair of naturalists, an original observer. His drawings and prose are lively, sometimes humorous, and usually finely detailed. By all accounts, he was an hard-working, energetic missionary (as he phrased it) of nature study. An ardent lecturer equipped with an ever-curious eye, his themes ranged from trapping to New England paths to flower pollination strategies. In at least some cases, the precision of his observations seems to exceed that of Eights and Cooper, but Gibson’s fame has dwindled since his death, perhaps in part because photography (of which he was an enthusiastic practitioner) has somewhat reduced the esteem granted illustrators. At least a couple of his works, Pastoral Days, about the passage of the year in southern New England, and Sharp Eyes, a year-long nature chronology, are fitting companions to the journals of our previous two naturalists. Our montage to two of Gibson’s illustrations, one of him working at his easel and the other of milkweed seed drifting away in the Autumn. Although Eights, Cooper and Gibson are far from being mere puppets of their eras, it is useful to briefly consider how each of them reflects an aspect of the human-nature relations of their days. 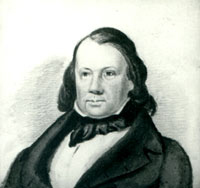 James Eights was a member of the explorer genre in that, aside from actual voyages of exploration, the closest he seemed to come to a profession was helping the likes of Eaton, Torrey and DeKay in their efforts to create the descriptive groundwork that was to form the basis for the work of later naturalists. Indeed, Susan Fenimore Cooper makes frequent mention of the work of these authors as she describes the nature she finds around her. However, like Thoreau and others of her time, she is also searching for a deeper link between the human condition and nature; Cooper was well traveled and could hardly have been blind to the growing divide between urban life and nature. The Hudson River School of painting can be seen as another response to this same disconnect. In some ways, her work can be seen as an effort to alert a increasingly alienated world to the value of nature, presenting it not as something exotic and ‘red in tooth and claw’, but rather as an important component of one’s home landscape. William Hamilton Gibson needs to make no such case – by his day, nature writing and illustration were popular and widely appealing. His forte was, perhaps, to urge people to look deeper – not only to see, but to try to understand. His works contain microscopic detail and evolutionary considerations, and yet he was a populist, dedicating himself to bringing his insights to wide audiences. Returning to our first paragraph, there is perhaps a third reason why these historical observations have modern significance: they illustrate ways in which we can view our worlds and our relationships with nature. Whether civilizations progress or not, I do not know; however, I am convinced that not all perspectives are discarded because they are proven archaic or irrelevant; some are simply forgotten as new fashions or distractions avert the public’s thoughts. These are worth periodic resurrection and comparison with the new reality of our day; the human condition of the 19th century is not so distant that we should suppose its pondering can provide us with no modern insight. James Eights: See this NYS Museum publication, James Eights by Daniel McKinley. In addition to providing a biography, Mr. McKinley provides ample extracts of his work. If you want copies of the original articles in their entirety, please drop me a line. Thanks to Al Breisch of NYS DEC for first alerting me to James Eights. Susan Fenimore Cooper: Rural Hours is available in the full 1850 edition and the subsequent, edited (by Cooper) 1887 version. Cooper signed the book simply “A Lady”, a by-line which hints at the complex gender and possibly family roles she was trying to negotiate. See this web page for an introduction to her works and their subsequent exploration. William Hamilton Gibson: Gibson was the most prolific (albeit shortest lived) author of the three. The primary works which we will be considering are his Pastoral Days or Memories of a New England Year and Sharp Eyes: A Rambler’s Catendar. A biography by John Coleman Adams is also available on-line.